With a stay at The LINQ Hotel & Casino in Las Vegas (Las Vegas Strip), you'll be steps from LINQ Promenade and 5 minutes by foot from High Roller. This 4-star resort is 1.4 mi (2.3 km) from Miracle Mile Shops and 1.8 mi (2.9 km) from Las Vegas Convention Center. This vibrant 4-star resort in the center of Las Vegas has an upscale on-site casino, poker tables, and video slots. Free WiFi is available in the lobby, and a concierge is on hand to offer local know-how and arrange pre-arrival services. Cool off at the LINQ pool, an exclusive pool for guests 21 and up that features views of the High Roller and LINQ promenade. Guests can cool off with a misting system surrounding the pool deck. Guests can enjoy first-come, first-serve open seating or rent a lily pad daybed on the wetdeck at the main pool. Tables can be rented at the second pool, which can be accessed by a standalone elevated deck. A center bar features 4 flat-screen TVs, 30 seats, an assortment of frozen drinks, draught beer, and signature cocktails. Food is also available at the pool from the Nook Express. Indulge in an afternoon at The Spa at The LINQ a full-service spa and salon. Relax with personalized aromatherapy treatments or try the Himalayan salt therapy cave. The Spa at The LINQ also features services such as spray tanning, airbrush makeup, and beard trimming. 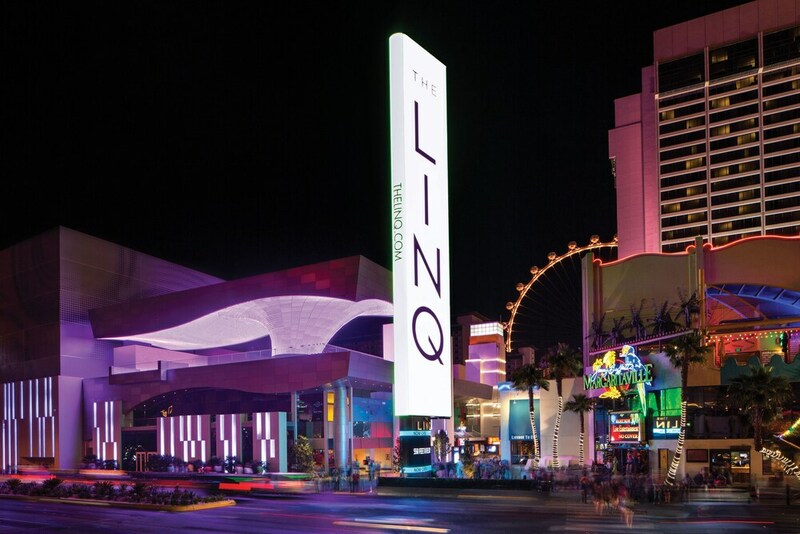 The LINQ Hotel & Casino has a bowling alley with live bands provide onsite entertainment. Stroll along the LINQ Promenade to access restaurants, bars/lounges, and shopping, offering guests plenty of options, without leaving the property. Complimentary use of a nearby fitness center is included and parking is available for a surcharge. Room service is available from 6 AM-1 PM. Guy Fieri's Vegas Kitchen & Bar - Asian-inflected reboots of American classics like wings, wraps and salads are on the menu at this casual restaurant, which also serves drinks. Brooklyn Bowl - This Vegas outpost of the popular New York venue serves American cuisine, and features 32 lanes as well as live music. Hash House A Go Go - This laid-back round-the-clock venue serves traditional American farm food with a playful, modern twist for breakfast, lunch and dinner. Off The Strip - A local favorite, this classic bistro serves up bar comfort food. This two-story restaurant is located directly on the strip and also features 3 bars and indoor or outdoor seating. Off The Strip is an ideal dining option whether having a large meal or grabbing a drink. Chayo - The Chayo Mexican Kitchen + Tequila Bar combines dining and a dynamic bar to create the ultimate fiesta at The LINQ Hotel & Casino. Corner Kitchen and Donuts - Sugar lovers can get their fix at this eatery featuring gourmet mini donuts. Flour and Barley - This restaurant specializes in Italian cuisine and serves lunch, dinner, and brunch.